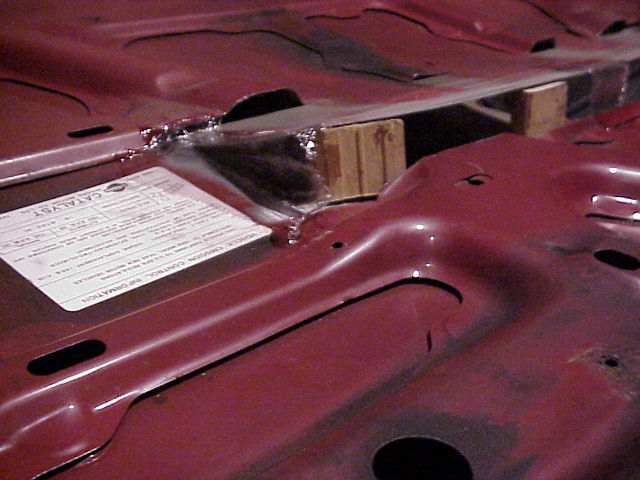 Custom vented hoods can be as expensive as $1,500. 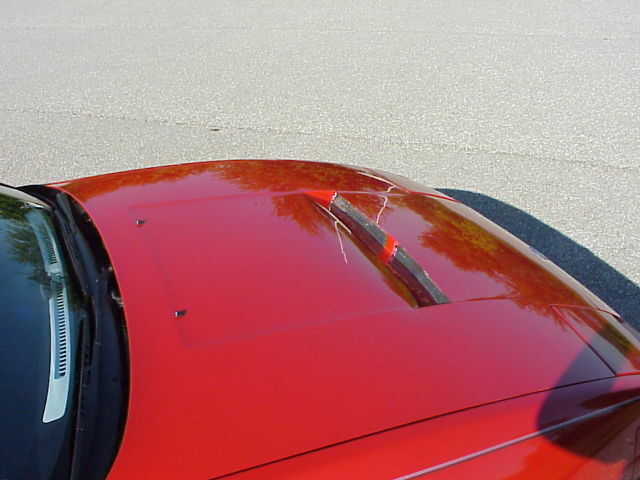 Making your own vent not only means that no one else will have the same design, it is also a cheap alternative to buying a custom-fabricated hood. Second comes supplies. Gather them and make sure you have enough room to work. The third, and possibly the most important: patience to do the bodywork. It takes a while for anything involving the body so you are warned. Take your time and don’t rush it. The more time you put into your hood the better it will look. 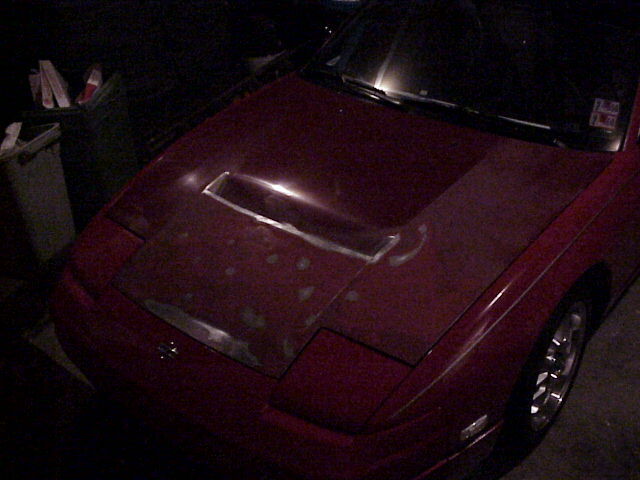 The first thing you need to think about when making a custom hood is where the hood vents / scoops reside. This is the most important part of desiging your hood. Make a few sketches of what you want your hood to look like. Get opinions and think it out. Next you need to decide if the idea you have is a feasible one. Check all the dimensions 3 times and take off the the spash gaurd on the bottom of your engine and shine a light up there and make sure you have room when the hood is closed. My hood vent ends up right between the valve cover and the fan shroud. Make sure you are exactly sure where the vent is going to be will fit and then mark where the cut will be with a marker. Take into consideration the hood supports you will have to cut. 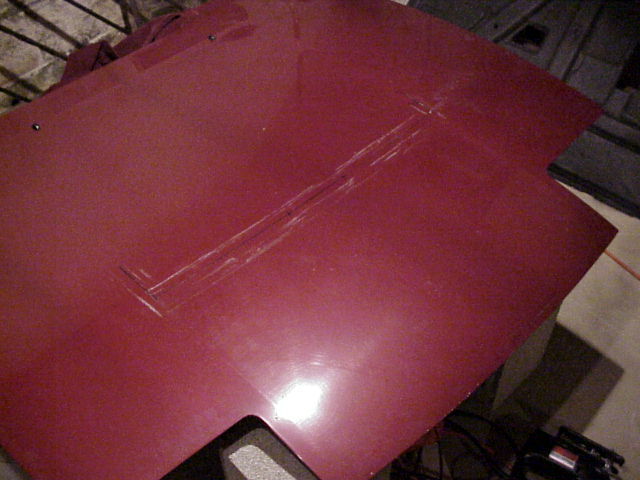 After you have your marks made, cut a small slit in the hood with the dremel tool and a cutoff wheel. This is so you don’t have to drill a big hole to fit the blade of the jig saw in. (Don’t forget to take the hood liner off first!) After you have cut a small slit in the hood place the jig saw on the hood and start chopping away. Go slowly so you are very accurate and don’t have any jagged edges. Go slowly and stopping often to check your work. 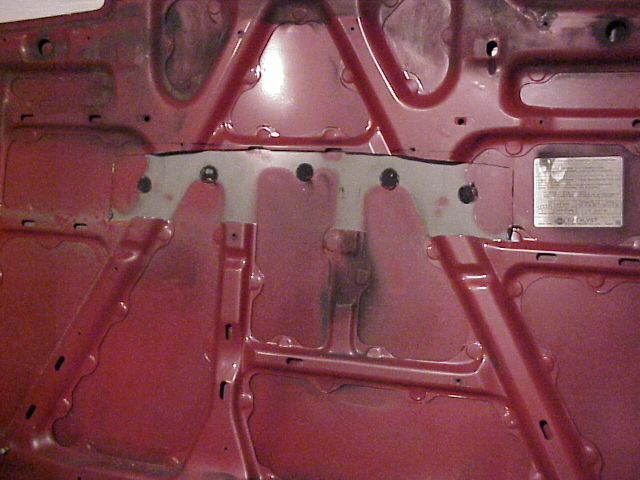 The Picture below shows the hood after marking and cutting. 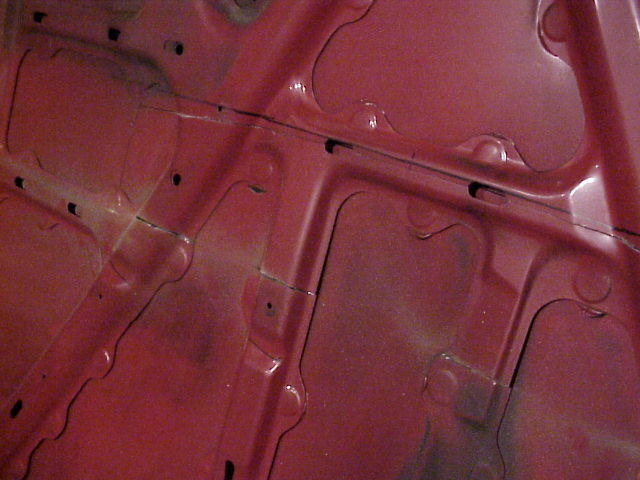 After you have finished all the cutting sand the area down to the metal around the cut on the top of the hood. 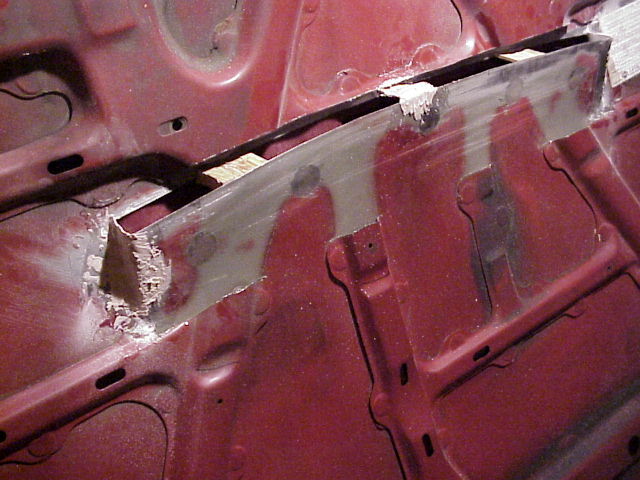 After you have done this mark where the under hood framing needs to be cut in order to make the bend. After you have marked the hood to cut the framing begin cutting with the cutting tool or Dremel tool. Be careful not to go through the top of the hood. After you are done cutting remove the framing carefully. The piece might be a little tough to pull off, it has adhesive between the framing and the sheet metal. Don’t be afraid to rip the stuff. 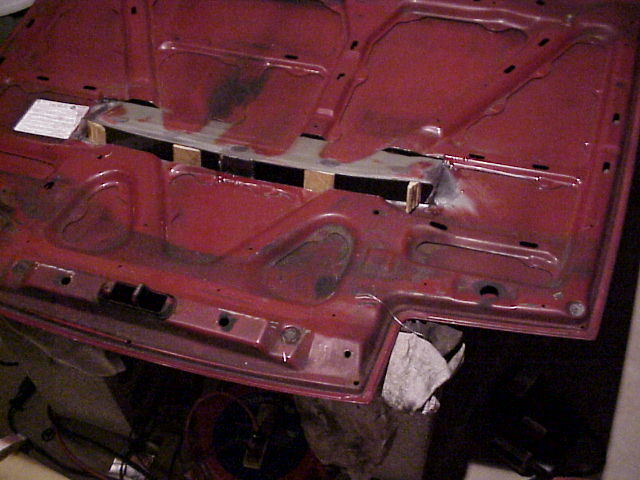 After most of the frame work is removed there is one more peice of frame work to be removed. This piece that needs to be removed is about 1/2 inch away from all the previous cuts to allow the sheet metal to fold down. See the black marker of the picture above? 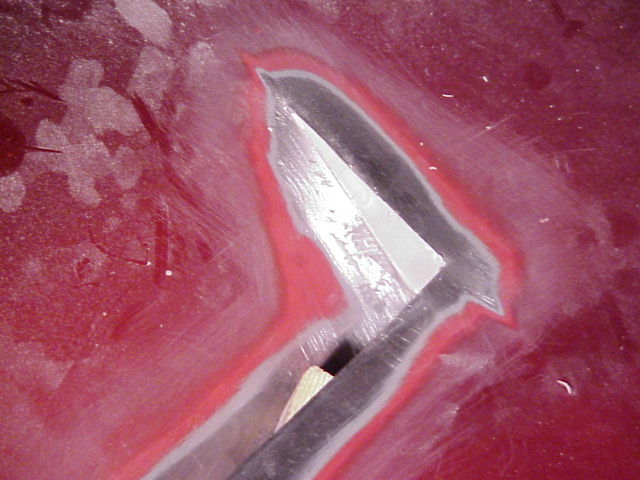 This is where the framework had to be trimmed to allow the sheet metal to fold down. After this is done make sure the flap can move without any obstructions. Now the fun part. Take your current hood off and pop the new one on to ensure that it fits. (This is the moment of truth.) When you decided that it fits push the flap down as far as you want it or until it hits something. I could get an 1 3/4 inch opening for the vent in my hood. That’s pretty big for a vent.After you envisioning what it’s going to look like when it’s done take the hood off and mark how big the vent can be. The picture below is the fitment process. After you are done deciding how big the vent can be cut some wood blocks the size of the proposed vent and insert them into the vent. This will hold the size while you work on the hood. The picture below shows the wood blocks in place. Now is the time to open the windows in your work area. Get out that fiberglass kit you got at the store. Follow the instructions on your fiberglass kit and mix the resin and hardener. 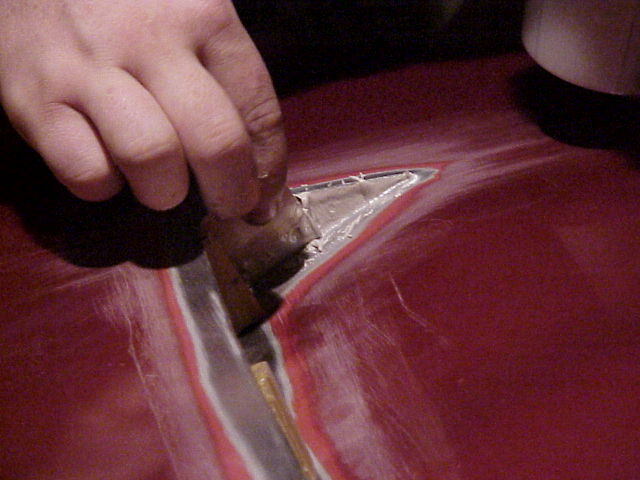 Apply the soaked fiberglass sheet as pictured below on the side of the vent and a support in the middle. Try to make the fiberglass like a wall at 90 degrees on the side. Try not to get too high on the fumes and go have a cold glass of iced tea or something. The Fiberglass will probably take about an hour to dry depending on how much hardener you used. After the Fiberglass has dried you’re ready to break out the Bondo. Fill in the sides of the vent and the support. Several applications will be necessary to get the right look of the wall. 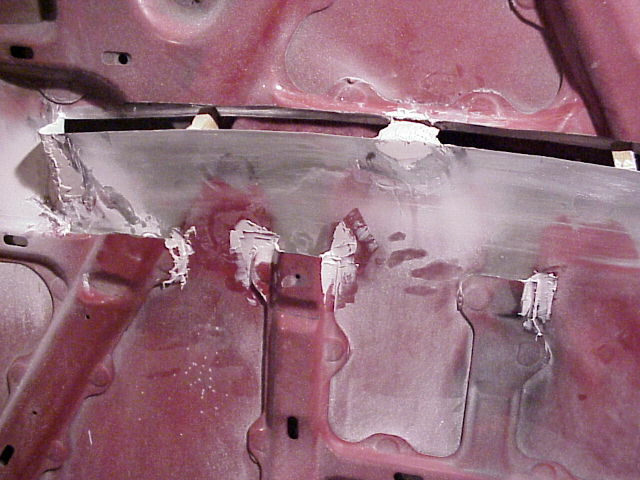 Sanding and re-applying the Bondo will be necessary. After the front looks good do the same to the back of the hood. Take your time and make it look professional. This part takes the longest. 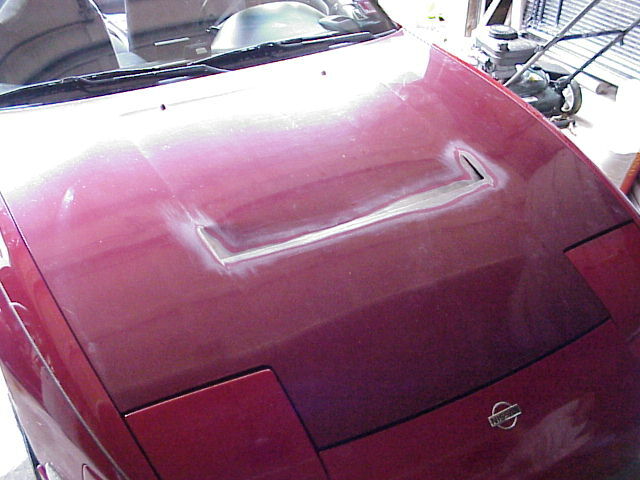 Notice in this picture I put some Bondo on the old hood framing to prevent rattles. Make sure there are no bubbles in the Bondo and everything is smooth. It’s almost ready to goto the body shop at this point. 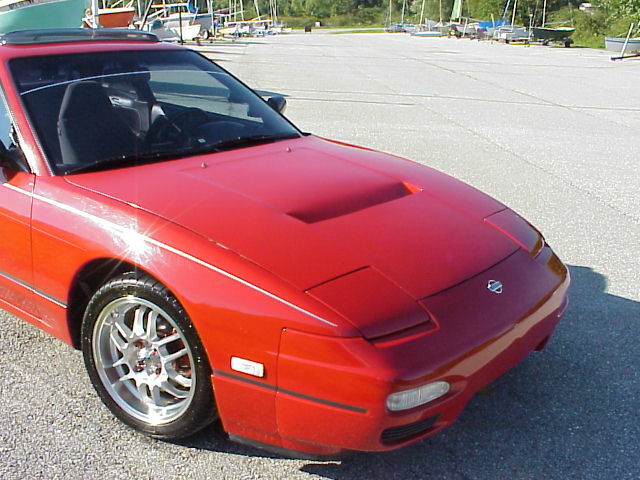 Take your old hood off right before you are ready to get the new one painted and put the customized hood on. Make sure it fits how you like it and don’t forget to tell the body shop to paint the underside of the hood too. Sometimes if you don’t tell them they won’t paint it.Get a few estimates before you get the work done and consider quality and if they will blend the paint. My hood cost $200 to get painted. No blending was necessary because the fenders were just painted. The picture below is the night before it went to the body shop. Well here is the finished product.. Whatcha think? Not bad for some homebrew low buck mod, and it’s very functional as well!